UFC 157 completed the rare trick of living up to its intense hype. Who stood out as stars? No. 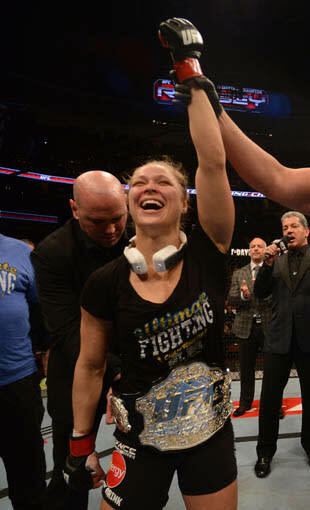 1 star — Ronda Rousey: Is there any better word to describe Rousey than star? After months of Rousey appearing on television, in magazines and on every site on the internet, she showed she's more than a media darling. Rousey not only escaped a submission attempt by Liz Carmouche, but also finished the fight with just 11 seconds to go in the first round. That's a star. No. 2 star — Robbie Lawler: Looking at this fight card, would you ever have guessed that Lawler would emerge as a star? Before returning to the UFC on Saturday, he lost three of his last five bouts. He was up against Josh Koscheck, who was eager to get a big win after losing to Johny Hendricks. But the power in Lawler's hands knocked Koscheck out in the first round, and earned Lawler a $50,000 Knockout of the Night bonus. No. 3 star — Dennis Bermudez: When the preliminary fights started, the Honda Center wasn't even half full. The UFC's tailgate was still going strong in the parking lot. But as Bermudez's bout with Matt Grice wore on, I noticed the stands filling up. Perhaps they heard about the Fight of the Year candidate happening inside, with Bermudez throwing everything he had at Grice, and Grice not only withstanding the punches but coming back with big punches of his own. They each took home a $50,000 Fight of the Night bonus. Who were your three stars from the night? Tell in the comments, on Facebook or on Twitter.